TV Anime "Yuri!!! on ICE" will start in October 2016 on TV Asahi and other broadcast stations!!! Character setting image and profile are open to public!!! The broadcast stations and broadcasting period of TV Anime "Yuri!!! on ICE" has been open to public!!! 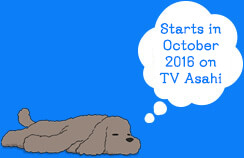 TV Asahi and other stations will start broadcasting in October 2016. Please check them from the character page.